How Does a Traffic Camera Work? 1 In just a few years, you will probably be driving. Maybe you are already looking forward to getting a driver's manual and your learner's permit. When that time comes, things like the laws of the road and driver safety will be very important to you. 2 One thing that may catch your attention as you learn all about driving is the red light camera. Some people love the cameras; they say that red light cameras make driving safer. 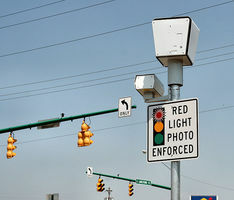 Other people hate them; they say that red light cameras are an unfair way to ticket drivers. 3 Red light cameras take pictures of drivers running red lights. The drivers are then sent tickets in the mail. 4 There are three main parts to a red light camera - the camera itself, triggers that are built into the road, and a computer to control the whole operation. Feedback on How Does a Traffic Camera Work?